This is a technique that I personally have used to write hundreds of pages of highly inspiring lyrics. And I’ve also taught many hundreds of musicians who have used this technique with stunning success also. … What you’re about to learn WORKS, and will vastly increase your ability to write amazing song lyrics! Ok, so with that introduction I’d like to introduce you to this technique. The funny thing is, it’s actually really simple and easy to do. Before getting into the “meat” of this idea though, you must understand an important fact. This is: Really GREAT lyrics usually come in the form of a STORY. In fact, a very big part of song writing is being a compelling storyteller. It‘s a fundamental truth in human psychology that one of the most effective ways to engage humans, and inspire them, is through storytelling. Just think: When you were in school or college and you sat in class listening to a subject such as mathematics, did you feel inspired? Did you find the task of memorizing facts and figures, and calculating numbershighly inspiring? On the other hand, I’m sure you’ve walked out of many movies feelingabsolutely thrilled. The movie was about an interesting STORY! If you involve storytelling when writing song lyrics, you will instantly connect with more people. They will hear your lyrics and bond to them far easier than any other style of lyrics. I could go on for hours as to why storytelling works amazingly well in song lyrics, but instead I’d like to do something far more helpful. I’d like to share with you how to write a great story. This way you’ll be able to finish this article and begin immediately writing song lyrics that are better and far more compelling! So what are the steps to writing a great story? Well, let me share with you the biggest key to this puzzle. 1. Become AWARE of the stories going on around you. 2. Practice telling these stories. But I must warn you. There is much more depth to these seemingly simple steps than you would think. To highlight this point, I’m willing to bet you’ve gone through today without noticing even a fraction all the great stories going on around you. You see, most people go through life in a sort of “zoned out daze”. They’re half paying attention to the things that go on around you, but tune out most of it. This is NOT the mindset of a great storyteller! They live in AWE of the world around them. They notice the little things. The sounds that go on around them. The colors. The smells. They are always ULTRA AWARE. They notice the details… and pay attention to everything that’s going on around them. And because of this they notice many more storiesthan the average person. In a moment I’m going to give you a little exercises to help “jolt” you into this state of ultra awareness. And you will love it because not only will it help you when writing song lyrics, it will also increase your overall enjoyment of life itself! First though, there is another principle you must understand that will lead to you writing song lyrics that will amaze and capture imagination. This principle is: To notice the big, juicy stories, you must first notice the little ones. What this means is, when you start paying attention to the smaller stories that happen throughout your day, you’ll also begin to tune into the much bigger, “larger than life” ones. Notice these moments, and tell these little stories ALL THE TIME. Do this and suddenly you will begin to tune into stories of much bigger scope. You’ll begin to notice connections that you would have never noticed if you didn’t become aware of all the “mini stories” that are happening around you all the time. You’ll find gold in some of these smaller stories, and diamonds in the bigger ones. You may not be able to turn every “small story” into “hit lyrics” (I don’t thing the funny comment in the elevator will hit number 1 on the charts), but that’s ok. The purpose of telling these more insignificant stories is to make you ultra aware so when the good stories surface, you'll pounce on them. And because you’ve been practicing your storytelling, you can do justice to this “big story”. Ok, so let me now give you an exercise or two so you can begin using these ideas to begin writing song lyrics that will capture the imagination of your fans instantly. Remember, these exercises took a long time to discover and tweak. And they work like a charm. So if it sounds “too easy”, or like it won’t work… I URGE you to put your doubts aside and try them anyway. You will be pleasantly surprised when your lyrics suddenly contain ideas that capture imagination and touch your fans deeply. Ok, here are the steps to writing song lyrics using powerful storytelling. Step 1: Buy a small notepad, and carry it with you at ALL TIMES. Whenever an idea hits you (either something going on around you, or something your mind has created), take out your notepad and write it down. 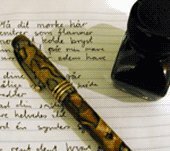 You can write a few short notes, or if you feel inspired, stop for a few minutes and let your lyrics flow. Remember this. NOTHING is to insignificant to write about. The idea is to soak in everything around you, and allow your mind to see things in it’s own way. Then write this perspective down on your notepad. This means if you see a cloud that reminds you of something, write it down. If you stop and have an interesting conversation with a stranger write it down. If you have to tie your shoelace and you notice a coin on the floor, write it down. Heck, even if you just had to tie your shoelace - write that down too. Pretend just for the moment you’re in a terribly dangerous situation! Can you imagine the way you would feel/act if you knew you’re life was in danger… how you would be SO AWARE of your surroundings… you’d have adrenaline rushing through your body, keeping you ultra focussed on everything around you. If something happened just behind you, you’d probably jump out of your skin! Step 3: After you get home, give yourself a small break and then try to write one of your notes out into a full story. Tell it in the most interesting, attention grabbing way you can. Use words that evoke imagery. Describe the situation in detail. See if you can think of an angle that makes it more interesting. Don’t be scared of being overly creative. See if you can take your audience and transport them into the situation itself. If you can do this 3 step procedure each day for the next week, I can guarantee you three things. 1. You’ll find it MUCH easier to “see the story” in every situation. 3. You’ll begin to notice much “bigger stories” - the ones that can form the basis for writing song lyrics that will “transport your fans into another place” for the duration of the song. Be sure to use this process. It will increase your ability when writing song lyrics many times over. And it will also make life far more enjoyable! Finally, if you want to take your ability when writing song lyrics to the highest possible level, be sure to check out my course The Songwriting Genius Within You. 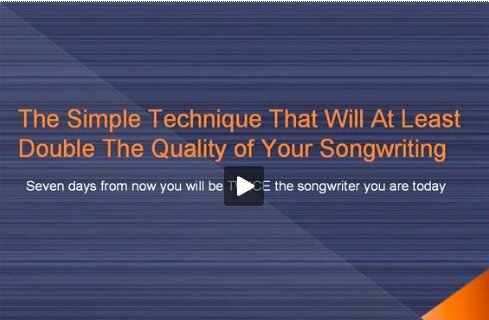 In this course you'll find many more powerful tips and techniques that will assist you both when writing song lyrics , and music. Out of the hundreds of songwriters who have taken this course, there have emerged many stories of "creative explosion", and "massive leaps in songwriting ability". To learn more about this course and to read stories from musicians who have taken it, click here. Your tips have helped me out greatly, I am becoming a great storyteller. I'm going to give it a try cause it's all been working so far. My only problem is stage fright thou. I love your ideas and right now, i just WISH I had more time to implement the practices. I am saving each article, though. Thank you, Thank you!!! I'm obsessed with songwriting...thank you!